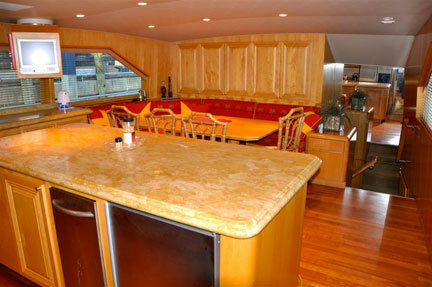 M/Y HORUS is equal parts classic sophistication and powerful modern yacht built by Broward Marine. 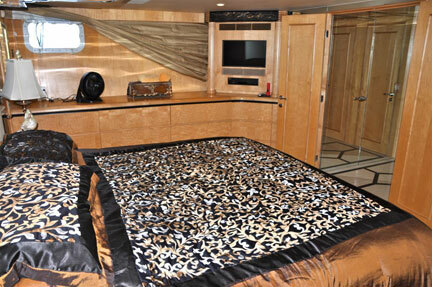 This carefully designed 110 ft Super Yacht has features and amenities usually found only on much larger vessels. 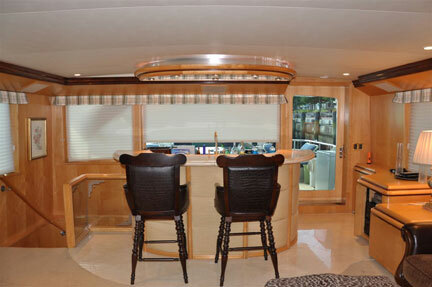 Within her sleek profile is a plush interior accommodating eight guests in luxurious comfort and elegance. The yacht´s interior is defined by a smart mix of fine marbles, precious metals and designer fabrics set among fine quality joinery creating the ambience of a sophisticated sea-going penthouse. Befitting her formal styling the elegant dining room forward of the salon and wheelhouse has an elegant tray ceiling showcasing a remarkable chandelier. 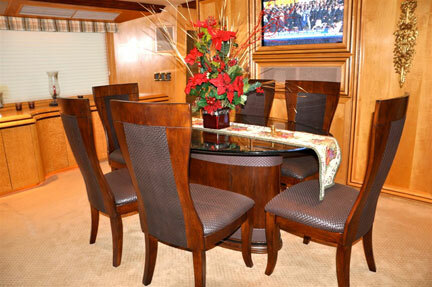 Upholstered walls and bird´s-eye maple furnishing create a tasteful backdrop for gourmet meals. The private nature of the dining salon is suitable for business meetings, making M/Y HORUS an excellent choice for corporate and private charter. 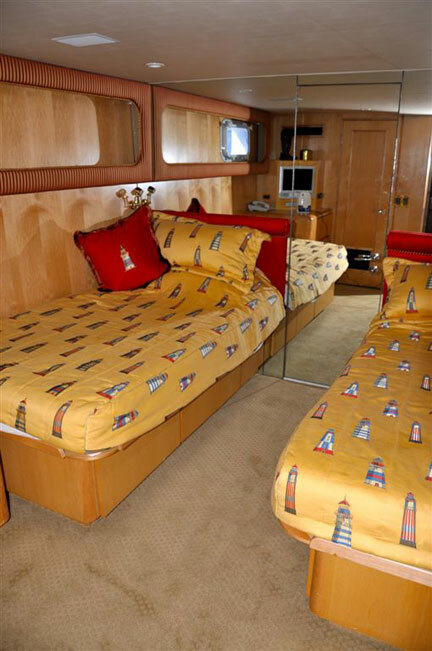 Amid her quiet surroundings are four exquisite staterooms in a split-plan layout on the lower deck. 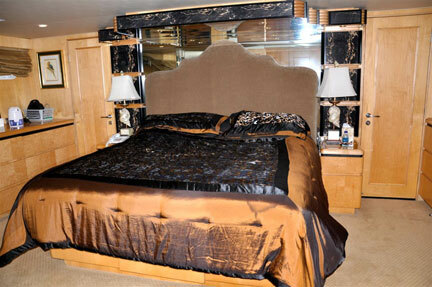 The large master stateroom is forward. It boasts a king-sized bed, an oversized walk-in-closet plus his and hers baths lavished with gold fixtures and marble surfaces and connected by a large walk-in shower. 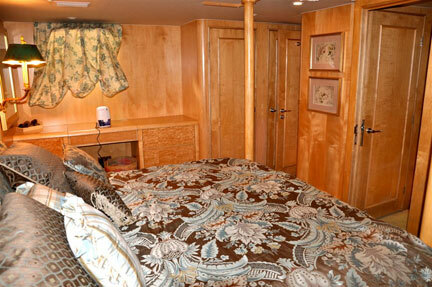 In the forward accommodation area is a comfortable twin cabin with en suite bath. 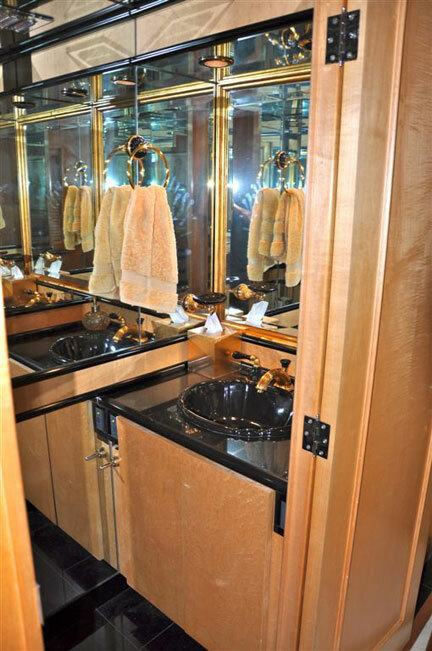 Two luxurious cabins with queen beds are in the aft accommodation area, each appointed with elegant furnishings, full entertainment electronics and of course, en suite baths. 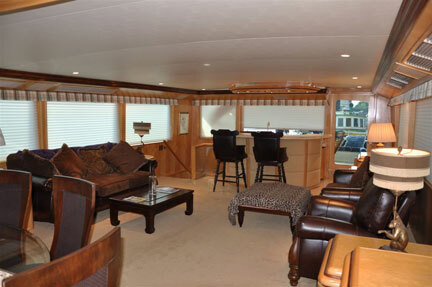 A spacious upper deck accommodates sunbathers as well as provides a shaded area for alfresco dining or cocktails under the stars. 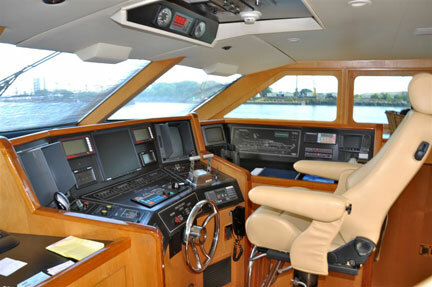 Feel free to watch the crew operate the yacht from the fly-bridge or the wheelhouse. The covered aft main deck also provides an area for informal dining around a gleaming teak table and entertaining with service from the salon bar. 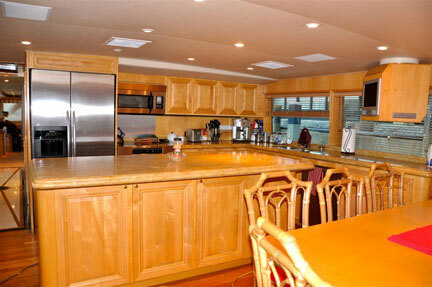 Here you will also find access to the water sports activity center and swim platform. As you cruise to interesting and memorable harbors you will be treated to discreet but attentive service from a remarkable, professional crew who will deliver you safely to your destination in style. 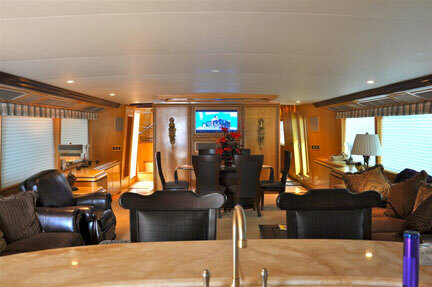 Completely air-conditioned, fully stabilized, satellite TV, entertainment center in salon and in all staterooms with large A/V library, stereo speakers on all decks, fly bridge/sun-deck combination with full wet bar and JennAire grill, aft deck wet bar with seating for 8, spiral stairs to large swim platform and flybridge.